Home › FAQ › What Does It Mean To Have an Undeclared Major? Taking the step to enroll in a two-year or four-year college or university often requires finding out answers to unknown questions, including what an undeclared major means. This particular question is often one of the most important for a prospective student to consider because it can change the direction or path of education by saving money and time. To complete either an associate’s degree or a bachelor’s degree, students take a number of courses, typically in both general education and in a respective major field of study. General education courses are required for any type of post-secondary diploma, and these courses typically include composition, mathematics, science, social sciences, and humanities classes. Often, the biggest difference between completion of an associate’s and bachelor’s is the number of general education requirements needed for completion. Once a major field of study is declared, however, students also must complete a predetermined number of courses within that field in order to qualify for graduation. 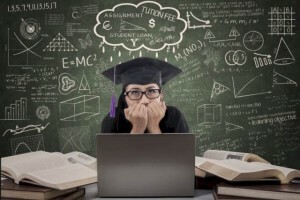 Common majors in post-secondary schools include business management, technical communication, psychology, elementary or secondary education, criminal justice, and computer science. Students complete several courses in these specific areas in order to gain expertise and advanced knowledge to enter into a specialized field. In a four-year degree program, around 36 credits are likely to be required directly within a particular subject. At some point in pursuing a degree, students will have to declare a major field of study. Once the major is declared, a student will be on a path to complete a very detailed and specific plan for graduation, meeting with advisors and other school personnel to ensure that every course counts toward graduation. Doing so helps students to stay on track and spend less money on courses that are not required and will not count toward completion of a degree. Many universities and community colleges highly recommend and encourage students to declare a major field of study as early in a post-secondary education as possible. For some students, though, choosing a specialized field can be challenging. Because choosing a major locks a student into a particular path, it also can limit the opportunities to explore various courses and subjects that would not necessarily count toward graduation. An undeclared major, however, allows a student to explore various subjects to count toward electives in any major while also completing the general education credits that each degree program will include. Not declaring a major can be particularly useful for students who have not made a final decision on a career path to pursue. This option can also be helpful for students who are considering finishing a degree in general areas of study. For example, an associate’s degree in applied science or a bachelor’s degree in general studies can be completed with easier transition of credits after not declaring a major rather than declaring one too soon and then changing to another field of study. Additional information on the long-term costs of tuition and other expenses can be found at the Federal Student Aid website. Not declaring a major often means more options. By carefully considering what an undeclared major means, prospective students can better open up opportunities to explore the future.